Today, I came home from work and found my curtains pulled down from the wall. Thank you dogs. The curtain rods were twisted and the brackets that held the rods up were pulled out of the wall. So, off to the Home Depot I went to buy new curtain rods. 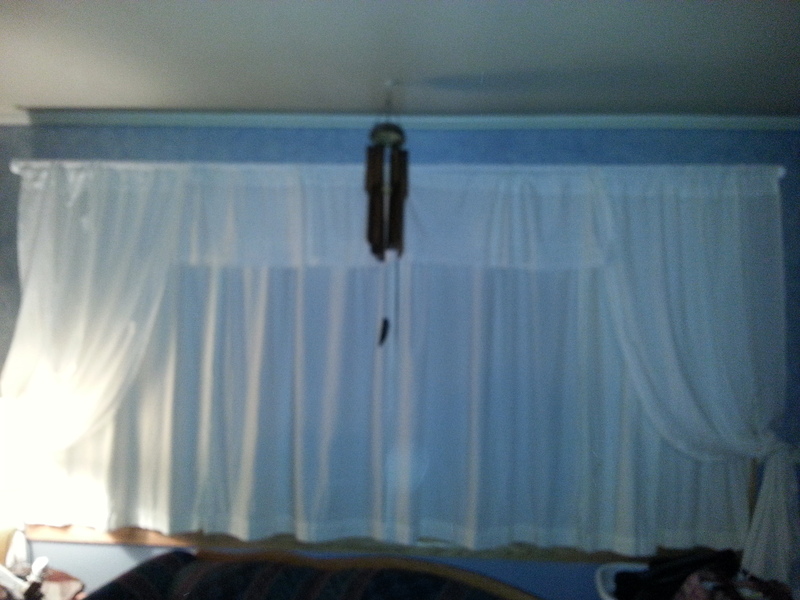 What I didn’t realize was just how expensive pre-made curtain rods were going to be for my space and situation. I would have paid well over $100, not the $35 that I did spend, if I had not thought of a better solution. I have included my solution here so that all my reader’s can take advantage of this brain storm, too. My materials are for double-rod system, 120 inches long, to cover my bow window in the living room. You can adjust your materials to fit your needs by simply asking a employee from the hardware store to trim your rods to size. I used Martha Stewart’s brand of brackets. 1. Sand the PCV pipes to remove any lettering and to prep the pipes for spray paint. Wipe them down after sanding. Spray paint at least two coats of white paint to hide the lettering. 2. Once the PCV pipes are dry, hang the wood brackets at the correct height and width over your window, using the instructions on the package. 3. Slide your curtains onto the PCV pipe and then put the chair stoppers on the ends of the pipes. This looks decorative and no one will know that you used a pipe as a rod. 4. Hang your curtains and enjoy a sturdy, beautiful look. If you try this method of hanging curtain rods, please share your results with a note and some pictures. I’d love to see what others invent. Happy Creating! Posted in How to do stuff and tagged Curtain Rods, curtains, DIY, Do It Yourself, easy to do, economical, Grandmother Musings, Home Depot, how to do stuff, Martha Stewart, postaday, Solutions. Bookmark the permalink.